The leaves are changing, the air is crisp, and the holiday season is quickly approaching. 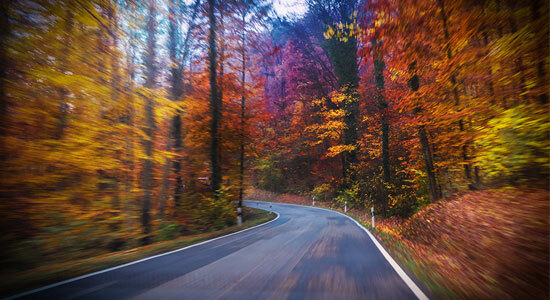 What better way to experience the beauty of autumn than with a relaxing drive in your car? If you choose to take the scenic route, it's important that you follow our fall driving safety tips first. Drivers should stay alert and slow down because of sun glare. Sun glare during the day can make it difficult to see pedestrians, street signs, and oncoming traffic. When the sun sets behind a car, it can make it nearly impossible to see traffic lights ahead or out your rearview mirror. Fog is considered among the most dangerous driving hazards. The risk of fog is greater if you're driving in areas surrounded by water, hills, trees, or mountains. Since Pennsylvania is largely composed of these types of topography, it's important to slow down and use your fog lights or low beams when there's fog. Also, remember to turn on your hazard lights in dense fog—it helps other drivers see where you are. Oil and rubber build up from traffic during the summer months, making the roads extra slick when in the fall when wet. Until the first few rain storms wash it away, drivers must use extra caution and maintain a responsible speed. Always remember: If your windshield wipers are on, so should your headlights—it's the law. And another thing: Though the first few rain storms may clear up the oils, the danger of fallen leaves is just around the corner. When the leaves get wet, they have even less grip than ice. Beware! As the weather gets colder, the effects of frost and ice can be deadly. Stay especially cautious when driving on bridges and overpasses. These areas freeze first. Also, give yourself enough time to get where you need to be on these cold mornings—save a few minutes to defrost your windshield before driving (and keep an eye out for black ice). Your tires – Colder weather will cause the air pressure in your tires to drop. Your tires must be properly inflated to maximize fuel efficiency and safety. Tires and brakes should be in good condition for fall optimal driving traction. Your windshield wipers – Inspect your blades and make sure they are fit to last through the fall weather. In particularly icy and cold weather (like we sometimes have in Pennsylvania), you may even want to invest in windshield wipers designed particularly for winter. Your fluids – Make sure all oil and fluids are clean. Also, check to ensure that all fluids (especially your windshield wiper fluid) are at or above the minimum recommended levels to protect your car and your safety. People are back from vacation, the air is breezy, and a new school year is underway. Traffic from vehicles and pedestrians increases in the fall, and driving requires extra caution. Children – With children again in school, be sure to slow down in school zones and near busses. As the sunlight wanes in the fall, it may be more difficult to see children playing or riding their bicycles in the road. Deer – Deer are more active in the autumn months, especially during dusk and dawn. Remember that if you see one deer, more are likely to follow. Taking these simple precautions now will save you future hassles. That said, we hope you never experience the devastation of a car accident. Our car accident injury attorneys know that accidents can still happen, even when you've taken every safety precaution. If you or someone you love has been injured in an accident, don't hesitate to call us. We're available 24/7, and the case review is free. And remember: There's never a fee unless we get money for you.